The pacific ocean reflecting the sky. A vast undulating field of blue. 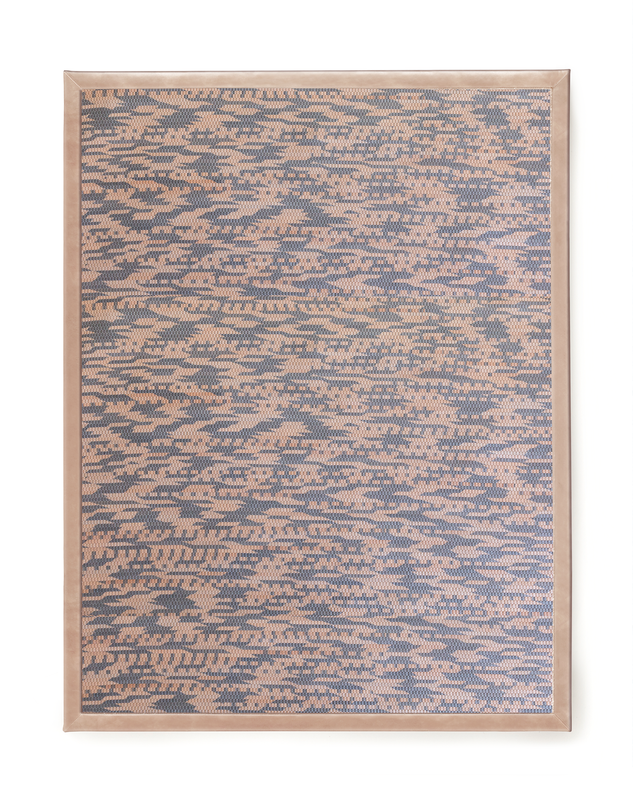 Wave is hand dyed in our studio on full grain leather, and woven in the United States on traditional looms. 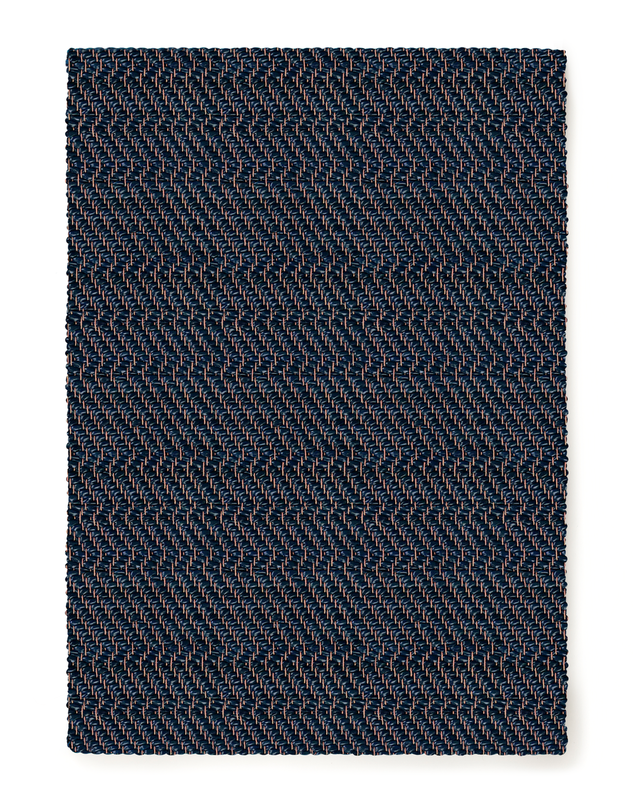 It's available in rugs up to 15 feet wide, with an amazing cushioned texture and refined selvage edge. A jagged cliff edge. The ridge and the view beyond. Irregular and graceful. Cliff is hand dyed in our studio on full grain leather, and woven in the United States on traditional looms. It's available in rugs up to 15 feet wide, with an amazing cushioned texture and refined selvage edge. Cracked earth and pebbles scattered along the trail. Fragments is hand dyed in our studio on full grain leather, and woven in the United States on traditional looms. It's available in rugs up to 5' wide with a solid leather bound edge and built in rug pad, as well as yardage for upholstery and finished pillows. Lines and dashes gather like a gentle spring rain. Mist is hand dyed in our studio on full grain leather, and woven in the United States on traditional looms. It's available in rugs up to 5' wide with a solid leather bound edge and built in rug pad, as well as yardage for upholstery and finished pillows. The Santa Monica Mountains: layers of earth, bands of clay, golden sun and the dusty pink of a distant LA sunset. 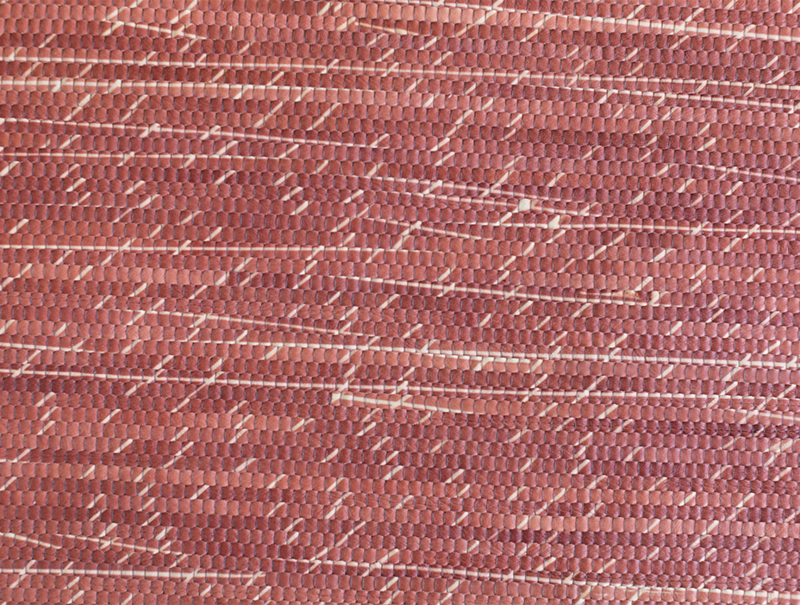 Canyon Stripe is hand dyed in our studio on full grain leather, and woven in the United States on traditional looms. 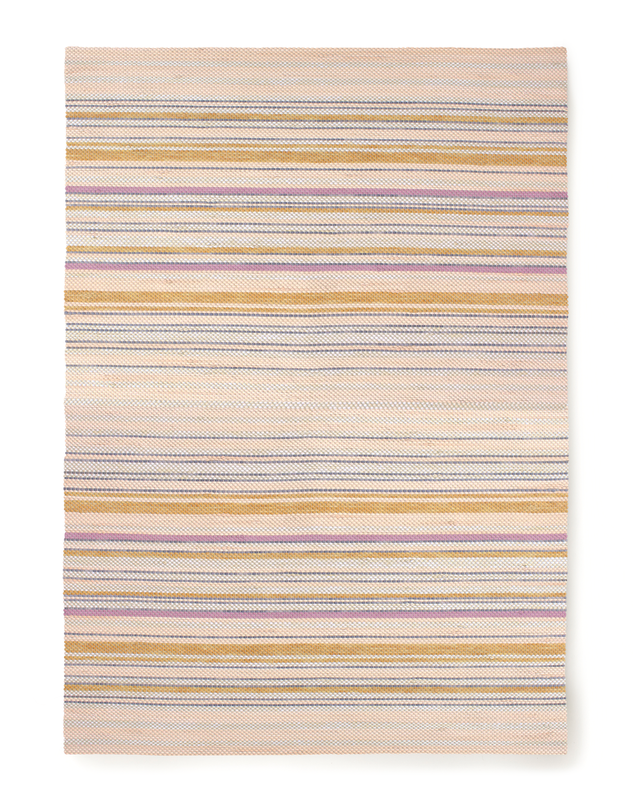 It's available in rugs up to 15 feet wide, with an amazing cushioned texture and refined selvage edge. Inspired by striated rock in shades of ash, slate, coal and smoke. 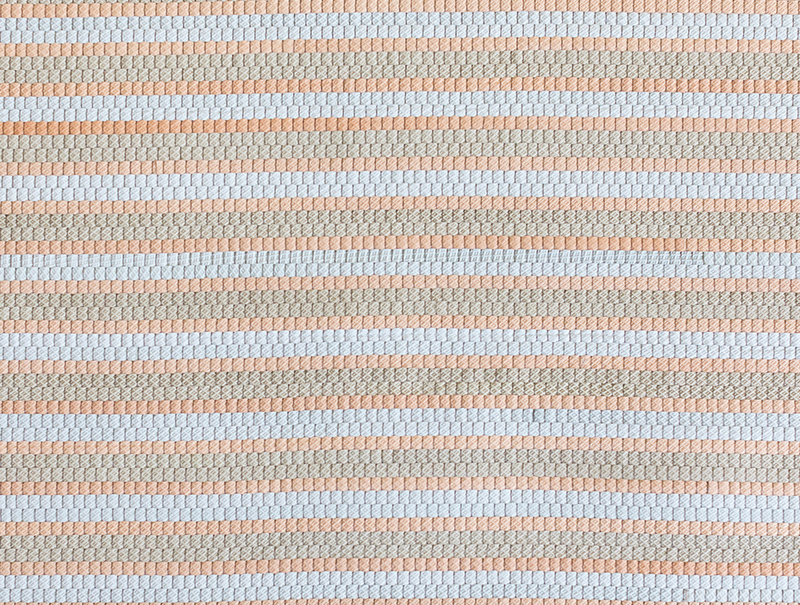 Granite Stripe is hand dyed in our studio on full grain leather, and woven in the United States on traditional looms. It's available in rugs up to 15 feet wide, with an amazing cushioned texture and refined selvage edge. A subtle visual with a sense of movement. Standing in a river feeling the invisible current. Current is hand dyed in our studio on full grain leather, and woven in the United States on traditional looms. 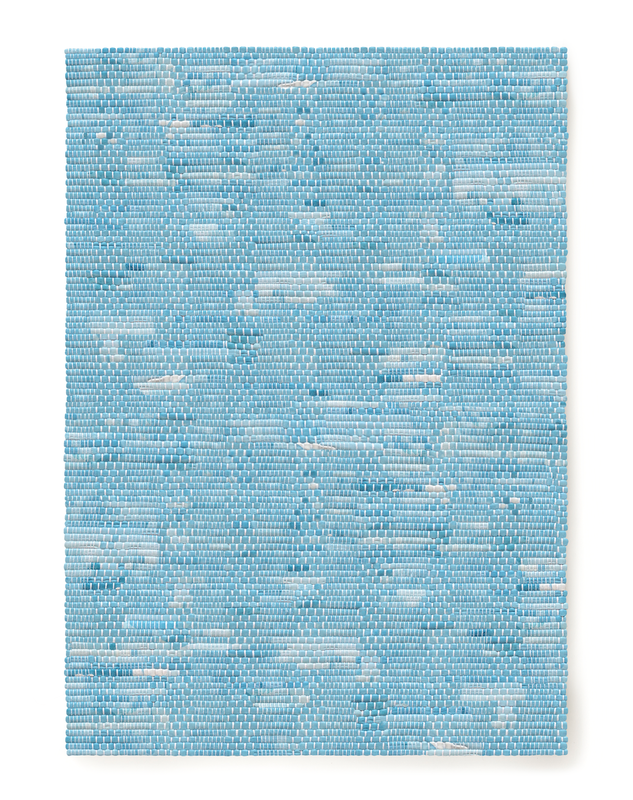 It's available in rugs up to 15 feet wide, with an amazing cushioned texture and refined selvage edge. Light refracts and scatters in a rainbow of colors. Prism combines subtly pearlised leather with multicolor warp threads to create a neutral with depth and complexity. Prism is hand dyed in our studio on full grain leather, and woven in the United States on traditional looms. It's available in rugs up to 15 feet wide, with an amazing cushioned texture and refined selvage edge. Mica is a mineral that naturally shimmers and has a unique layered structure. Its beauty is in the subtle interplay of matte and shine. Mica is hand dyed in our studio on full grain leather, and woven in the United States on traditional looms. It's available in rugs up to 5' wide with a solid leather bound edge and built in rug pad, as well as yardage for upholstery and finished pillows. Glacial blues, sagebrush greens, and natural honeys combine to create our most versatile neutral. Drift is hand dyed in our studio on full grain leather, and woven in the United States on traditional looms. It's available in rugs up to 5' wide with a solid leather bound edge and built in rug pad, as well as yardage for upholstery and finished pillows. Rugs are made to order and priced by the square foot. Rugs can be made up to 15 feet wide with any length. Finished rugs come with a polished selvage edge or rich leather binding. Fine strips of leather are woven to create polished pillows with a solid leather back. Woven leather upholstery is 60" wide and comes backed with fabric for easy use and various applications. Woven pillows are available in our standard sizes. Our leather is hand dyed in Brooklyn and woven in the United States on traditional looms. We offer white glove delivery in select cities. We recommend rug pads for certain floor types. Shop them here. In the New York region? Schedule a visit to our workshop and showroom in the Brooklyn Navy Yard. Thank you! We will be in touch shortly to confirm appointment.